NETSCOUT’s nGeniusPULSE delivers the visibility needed into today’s evolving IT eco-system to ensure the availability, reliability, and performance of your mission-critical business services across your multi-cloud environment, from wherever users need access. Anytime: nGeniusPULSE uses active, synthetic testing to verify the availability and performance of the applications and services your users need. Automatically and routinely simulate real user actions, testing the applications – and components within the application, services, and the network – even when no users are on the system. Anywhere: With nGeniusPULSE application testing, you can measure key business services from wherever the user is located. The definition of “remote sites” has expanded beyond branch and store locations and can now mean campus locations, on mobile equipment, on the factory floor, at a home office, or anywhere users or Internet of Things (IoT) devices need access to business services to do their jobs. Any Application: Test any web-based application or service, including SaaS, VoIP services, and on-premise custom applications, no matter how they are deployed: public cloud, private cloud, on-premise, or in a hybrid environment and no matter how they are accessed: on a wired or Wi-Fi connection. See the path and hop-by-hop analysis for troubleshooting service access. Business Transaction Testing monitors specific functions from log-in to log out for key business applications, to ensure that all components of the application are available and to identify performance problems. Monitor solutions such as Salesforce® solutions, Microsoft® Office 365®, G-Suite™ or create tests to monitor other applications that are critical to your business. Business Transaction Testing shows steps within an application. With two deployment options, you can test from anywhere your users work over wired or Wi-Fi connection. The Hardware nPoint is a micro-appliance that plugs in to Power over Ethernet (PoE) or using a USB port. Or, you can use the software-based Virtual nPoint on a laptop or PC. 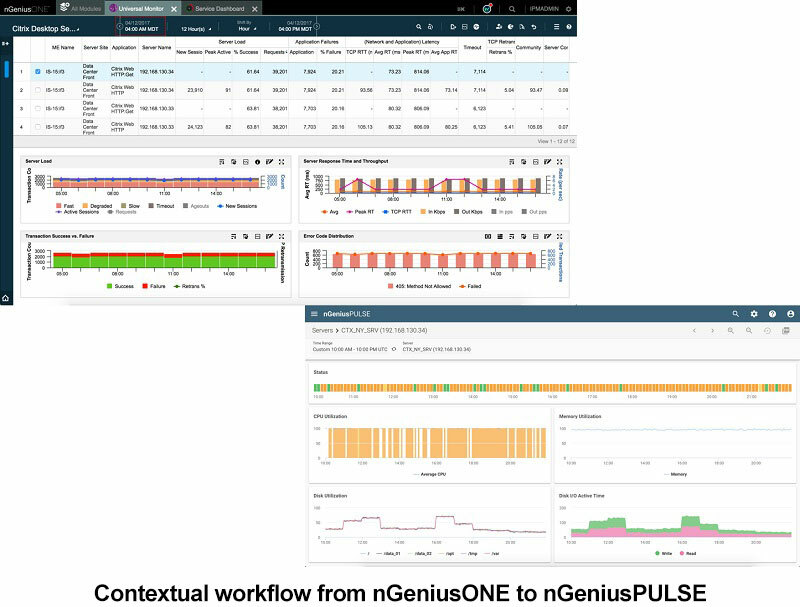 Combined with nGeniusONE, nGeniusPULSE delivers the broadest visibility available across the enterprise by routinely and automatically monitoring applications and services for performance and availability, while also verifying the health of the underlying infrastructure that delivers those services. Monitor the health of servers, routers, switches, and interfaces and even wireless infrastructure including controllers and access points. View statistics such as CPU utilization, memory, disk usage and I/O, etc. in easy-to-read graphs, pinpointing the exact cause of infrastructure issues affecting the business service and its users. nGeniusPULSE delivers vSphere infrastructure discovery and health for monitoring VMware virtual machines and hypervisors to access infrastructure intelligence for today’s hybrid cloud architectures. With direct drilldowns from nGeniusONE, it’s easy to see exactly where the problem is and assign appropriate resources to get it resolved. No more having to switch to a disparate component management tool when an infrastructure problem is suspected. Your organization and IT team may want to test additional performance indicators based on your unique environment. In addition to pre-configured ping and port-open tests, for some situations, nGeniusPULSE allows you to write and import scripts to create custom tests such as bandwidth speed, loss, or latency in your network – or other critical services or network components. nGeniusPULSE provides visibility to monitor availability and performance of apps at remote locations. nGeniusONE Service Assurance platform monitors key bank applications allowing IT to improve MTTR. NETSCOUT’s nGeniusPULSE delivers visibility needed into today’s evolving IT eco-system to ensure the availability, reliability, and performance of your mission-critical business services. nGeniusPULSE is the latest addition to the nGenius Platform, adding synthetic testing and infrastructure health monitoring. The NETSCOUT approach enables the Wi-Fi expert to focus on solving issues that are actually due to Wi-Fi.